The risk of mold growth in the air ducts is considerable due to the fact that condensation can occur frequently in the HVAC system. It is essential for you to take measures to prevent mold as it can cause serious damage and allergies to your family. With proper HVAC maintenance, you will achieve excellent results and a high level of protection. As you certainly know, moisture and heat are the main factors responsible for mold growth. You cannot do anything about the heat transfer in the HVAC system, but you can take the required measures to prevent the build up of moisture. The parts of air ducts that pass through parts of the house which are not air conditioned like the attic must be properly sealed and insulated. This will prevent the build up of moisture due to condensation. Inspect the sealing and insulation on a regular basis to ensure that they are in good condition. You must provide timely air duct seal repair when required. Leaks and standing water must be identified and removed promptly. 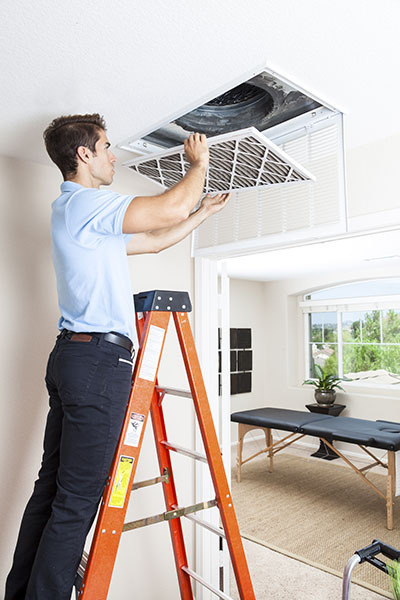 It is easy to identify such issues with regular air duct maintenance. Ensure that the drain pans of air handling units are in their correct position. They must slope downwards. This will ensure that water will never accumulate under the cooling coils. If this happens, it must be removed promptly. You need to provide regular inspection to the air ducts and to the other HVAC system components. Pay special attention to the ones which can retain water. These include the components made from fiberglass. If they are wet, they must be removed timely. This is a major air duct repair job which must not be delayed. 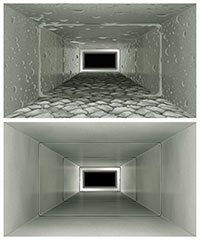 Proper air duct cleaning is required on a regular basis for the prevention of mold growth. If any mold has already grown, it should be effectively removed. A special chemical treatment can be applied for the prevention of future growth.